This recipe for Sweet and Sour Meatballs in the slow cooker is an incredibly easy meatball recipe that is always a big hit!! They make the perfect game day appetizer, easy dinner idea over rice or holiday party food! 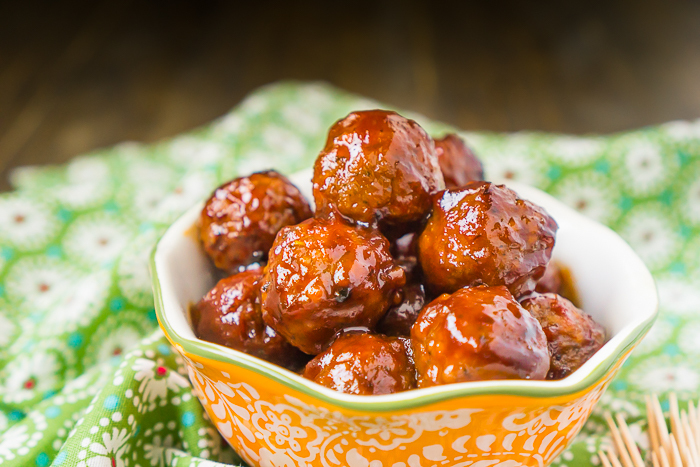 Slow Cooker Sweet and Sour Meatballs are easy and delicious! My favorite recipes are ones that require less than 10 minutes of prep work, like these slow cooker Sweet and Sour Meatballs! We have added them to our party menus many times because they are always quickly eaten up, so you should definitely consider them while planning for the upcoming holidays and game days. We have also made them for just ourselves for an easy dinner idea. When we do so, I normally serve them alongside brown rice and a salad. With only a few kitchen staples, it’s easy to keep everything on hand in the pantry and freezer. Since these easy sweet and sour meatballs are made in the slow cooker, it’s easy to prep them ahead of time for a party and keep them warm throughout the day. Just make sure to turn the heat down on the slow cooker to warm once your meatballs are cooked thoroughly to avoid the sauce burning. When we have the time, I love making a large batch of homemade meatballs that we enjoy eating with pasta, with marinara sauce on a sandwich and even with sweet and sour sauce in the slow cooker! When time isn’t on our hands, this cocktail meatball recipe is still delicious using a bag of store bought meatballs in the freezer section. We usually have at least one bag in the freezer for those easy dinner nights. Side Note: I always prefer homemade chicken meatballs or homemade turkey meatballs! In fact, one of my favorite meatball recipes is my blue cheese stuffed buffalo chicken meatballs. The frozen bags never seem to have the same flavor or texture. Meatball recipes are honestly a favorite in this house! 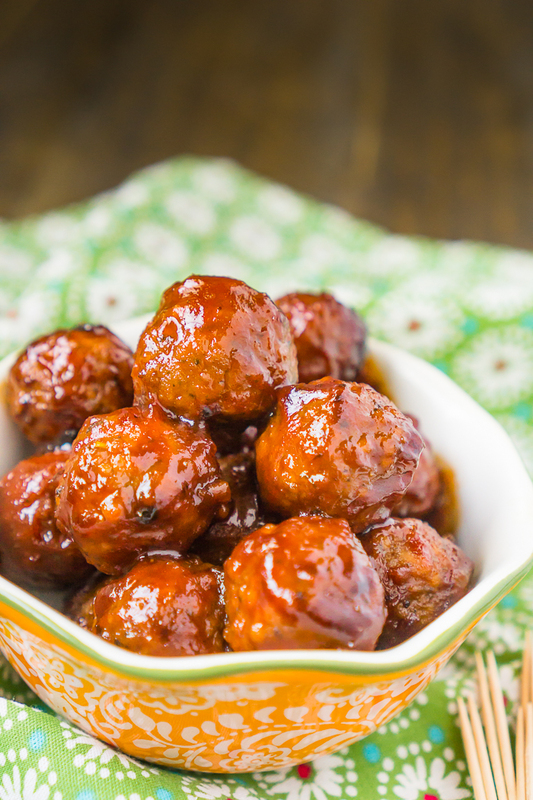 They are versatile with a wide range of flavor options from Honey Sriracha Meatballs to Pineapple Tequila Meatballs or Chicken Parmesan Meatballs! We tend to have them at least once a month during these colder months which works out well because Liam loves them, too! First, you will need to gather your chili sauce, grape jelly, Worcestershire sauce, pepper and chili powder. Add all of these to your slow cooker and mix thoroughly to make the sauce. If you are thinking this combination of ingredients for sweet and sour sauce sounds weird, I completely agree with you! But it does totally work! Chili sauce and grape jelly just work together in an unexpected way. Then, you will need to choose which meatballs you would prefer to use – homemade meatballs or frozen store bought. If you are wanting to make sweet and sour chicken meatballs or sweet and sour turkey meatballs, I strongly suggest making them from scratch as store bought just won’t be the same. Add them to your sauce and toss. Cook refrigerated meatballs on high for 2 hours and frozen meatballs on high for 3-4 hours, stirring occasionally. If you need to them keep them warm for a party, move the slow cooker down to warm to prevent any burning. I get a lot of questions about chili sauce, so I thought I would address some of them here. Chili sauce is not the same thing as ketchup or cocktail sauce, though all are tomato based condiments. Heinz Chili Sauce is the most common to find in grocery stores. Chili sauce is made from chiles, tomatoes and spices, making it similar in consistency to ketchup but spicier. It is not especially spicy though so don’t be concerned about your guests, especially when combining it with a sweet jelly. Cocktail sauce, on the other hand, gets it’s kick from horseradish and often includes lemon juice. Now, Let’s Quickly Mix Up Some Slow Cooker Sweet and Sour Meatballs to Enjoy! Slow Cooker Sweet and Sour Meatballs is an incredibly easy meatball recipe that is always a big hit!! They are the perfect game day appetizer or easy dinner idea over rice! Cook refrigerated meatballs on high for 2 hours and frozen meatballs on high for 3-4 hours. Stir a couple times throughout for even cooking. If you are cooking a larger batch of meatballs, you will probably need to cook for longer. Hi Maggie, I love this recipe for sweet and sour meatballs. I haven’t made these in many years, I think it’s time to make them again. The kids love these. Maggie, these are wonderful!!! I can’t wait to make these – us Germans put grape jelly on everything, so these are a guaranteed winner in our house!! Thanks much! And beautiful site by the way, such valuable content. I’ll be visiting often! These look really great!! Just delicious I love all the ingredients you use! I love meatballs, but have never had Sweet & Sour ones before. These sound yummy! You really just can’t go wrong with that recipe at all. Honestly, that’s just classic feel good yum! Stopping by from SITS Comment Love… This looks delish! I’ll have to give it a try. This recipe looks delish! I’ve never made meatballs in the crockpot, but I love anything that will save me some time so I’ll definitely have to give this a try! Thank you, Madison, and thank you for stopping by and commenting! I really appreciate it. YUM – I love meatballs, and actually have a bourbon whiskey slow cooker recipe that I swear by, but I’ll have to try this one too. We always have grape jelly in the house, after all! 😉 Stopping by via SITS and glad to have found your blog! Oooh, bourbon whiskey recipe sounds amazing! What a great idea!! Have you ever posted the recipe? Thank you so much for stopping by. I can’t wait to check out your blog as well! I love crockpot recipes and sweet and sour sauce. I must try this! Oh these sound really good! I love little bite-sized meatballs to snack on throughout the day on a weekend! These look so easy and delish. I will have to make these for my boys. I really enjoy your blog. Stopping by from SITS comment love. Thank you, Lisa! I’m so glad you stopped by!! They definitely are easy, especially if you need to make a large batch for growing boys. these look amazing!!! I can’t wait to try them, thanks for sharing. Thanks, Mel, and thanks for stopping by! I hope you try it and love them! I was so happy with how they turned out. And thank you for stopping by! If interested, there is also a Pick Your Plum giveaway that started today on the blog. 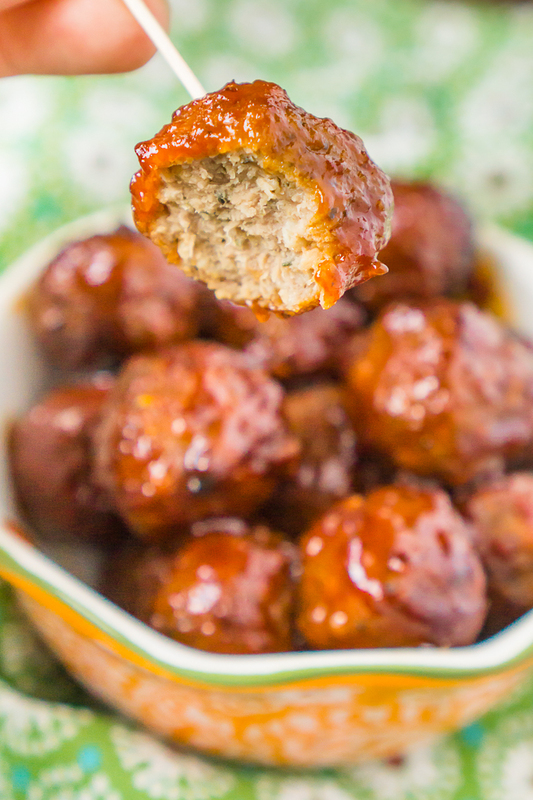 I’ve never tried meat balls on crock pot and this made me want to try this week! Hopefully I can whip this up. Pinned this! It is really easy to warm them up in the crock pot and keep them warm for a party! I hope you can enjoy!! Yummy! This looks very good and I know my daughters would really enjoy this. Thanks for sharing the recipe! Thank YOU for stopping by!! I hope you enjoy!! Yum, these look delicious. They would be really great as an appetizer. I plan on making a big batch the next time we have people over! They were so yummy! !